It’s been over twenty years since I first played with the phenomenal Brian Eno, in the 1980’s NYC art-rock group, “The Same”. The Same featured Eno’s friend, the Welsh singer Cloda Simmons, as well as keyboardist Carter Burwell, who would go on to score most of the Coen Brother’s films like, “Blood Simple”, “Raising Arizona”, “Barton Fink”, and “Miller’s Crossing”. Rounding out the group was M.I.T. guitarist Chip Johannsen, who built one of the world’s first guitar synthesizers, Madonna’s drummer Stephen Bray, bassist Stanley Adler, and Moira Moynihan, (daughter of the late NY Senator), on backing vocals. I played “Roto-toms, slit drum and assorted percussion”. Eno and The Same had a profound effect on my musical career, and now he re-emerges with his first solo album in fifteen years, “Another Day On Earth”. Electronic Musician’s John Diliberto described Another Day on Earth as an ambient song cycle that is full of yearning and a mood that Brian Eno has called “brave and resigned.” Even in song, Eno is a master of ambience, creating detailed soundworlds and lyrics that don’t so much make sense as create a feeling. It’s taken him 15 years to create a new vocal album, and the songs span that time, with the welcome reprise of “Under,” a devastatingly beautiful hymn of loss and redemption that dates back to 1991’s aborted, unreleased My Squelchy Life album. It’s turned up before on the Cool World soundtrack and Eno Box II: Vocals. Joining “Under” as one of Eno’s most sublime songs is “And Then So Clear,” a paean of wasted longing and hope with its cycling rhythm, ethereal guitars, and pitch-shifted vocal harmonies. You can hear Eno’s love of gospel music on “This” and “Bottomliners,” and can almost picture them in a particularly pensive Baptist church with his double-tracked vocals emulating a solemn choir. But it’s not all minor-key reflection. Eno also unleashes a couple of fractured tunes, like “Bonebomb,” which is from a project in which he mutated the meter of poets reciting their works. Another Day on Earth is a more personal album from the ambient avatar, a recording of rare and meticulous maturity. Brian Eno was a founding member of Roxy Music, manipulating sounds on their debut album and the legendary For Your Pleasure. Leaving Roxy Music in 1973, he began his solo career with the album Here Come The Warm Jets. Eno has released a string of critically acclaimed records, and over the years his work has been compiled on two Best Ofs and three Boxed Sets. As well as Eno’s own albums, he has collaborated with the likes of John Cale, Nico, Robert Fripp and the band James. His co-writing and playing on David Bowie’s Low, Heroes and Lodger helped define the sound of this classic trilogy. After having produced U2’s The Joshua Tree, Unforgettable Fire, Zooropa and Achtung Baby, he formed a loose collective with members of the band and other artists (including Luciano Pavaarotti and Howie B.) to write and record Passengers: Original Soundtracks 1″ released on Island Records. 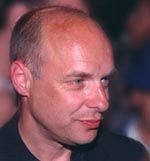 Eno is also one of the most significant record producers of our age. His ability to steer artists into radical new areas was first made obvious on the three albums he made with Talking Heads, culminating in Remain in Light in 1980. By this time he had also produced the seminal compilation of New York’s New Wave, No New York, and Devo’s Q: Are We Not Men? A: We Are Devo. In the 1980s he applied his gear-changing skills to U2, helping an already great stadium rock band turn into the most original and creatively-challenging mega-band since the Beatles. Other production credits range from Real World artist Geoffrey Oreyema to the band James as well as singer Jane Siberry and performance artist Laurie Anderson. In 1995 he returned to one of his most fmous collaborators, producing Bowie’s Outside. A pioneer in tape-looping and other early forms of sonic manipulation, Eno’s work with Robert Fripp in the early 1970s (No Pussyfooting’ and Evening 5tar), signalled a determination to look beyond the conventional song format. His unusual, strategic approach to music-making (more likely to involve drawing a diagram than writing down chord changes) was made clear with the 1975 publication of Oblique Strategies” – a set of problem-solving cards for artists. Also in 1975, Eno released Discreet Music, naming the new genre he had discovered ‘ambient’. Bringing the ideas of John Cage to a pop audience, the true significance of Eno’s landmark ambient releaes (including Music for Airports and Thursday Afternoon only became apparent in the early 199Os when ambient exploded into the charts and into a range of new hybrtd musical forms. Eno also pioneered sampling and the use of found sounds on My Life in the Bush of Ghosts, a collaboration with David Byrne released in 1981; again it would be some years before the rest of the world fully cottoned on to these ideas. Eno’s instrumental works continue, with The Shutov Assembly’ released in 1992 and the minimal masterpiece Neroli in 1993. His composition for Derek Jarman’s Glitterbug soundtrack was reapproached by Jah Wobble and released as Spinner in 1995. Like all good rock musicians, Eno went to art school. Unlike most of the rest of his peers, he continues to work in the visual medium as well as in sound. His video installations have been exhibited at galleries around the world, including the Stedelijk Museum, Amsterdam; the Venice Biennale; the Pompidou Centre in Paris as well as a permanent exhibition opened October 1995 in Austria’s Swarovski Museum. Combining sound and vision, Eno’s works create an alternative environment for the gallery-goer, just as his ambient albums create a sense of space for the listener. Now visiting professor at the Royal College of Art, Eno collaborated with Laurie Anderson and some of his students earlier in ’95 for the Self-Storage installation in Wembley, London. 1996 saw Eno’s Generative Music come into fruition. His long- tirne interest in self evolving compositions has resulted in the creation of a PC floppy disc using Sseyo Koan software. Eno sees this as the most exciting of his musical outptlts: it is never heard the same way twice. Year (With Swollen Appendices) Eno’s diary and essays was published by Faber and Faber, May 1996. This book gives a rare insight into the daily life works and musings of the artist. What Eno brings to all his work is an ability to take ideas from one area of life and apply them to another. Thus, his ambient music resulted from applying ideas that were floating around the classical world and applying them to new instruments and recording technology. Similarly his production technique is more akin to the way a management consultant works, than the way a conventional record producer works; that is, rather than sit behind a mixing desk for months on end, Eno likes to pop in regularly, but only occasionally, enough to steer the project, but not so much that he can’t hear the music with a fresh pair of ears. Eno has very little interest in new technology for its own sake, preferring technology that you can get a result out of now, this minute, without studying the manual. Around 1998, Eno was working heavily in the world of art installations and a series of his installation soundtracks started to appear, most in extremely limited editions (making them instant collectors items). In 2000 he teamed with German DJ J. Peter Schwalm for the Japanese-only release Music for Onmyo-Ji. The duo’s work got worldwide distribution the next year with Drawn From Life, an album that kicked off Eno’s relationship with the Astralwerks label. In 2004, Virgin and Astralwerks began a reissue campaign of his early EG albums. That campaign continues into 2005, culminating in the release of his first solo vocal album in 15 years. A few years later, Stephen Bray and I happened to run into Eno while we were walking around Greenwich Village. The three of us were coincidentally visiting NYC for just the weekend! He was still living in Paris and his “folks were fine”.